As you can see from this blurb posted in the 11 Sept. 1999 Times-Picayune newspaper, the CCI Woodie finally has a name. It's called the "MegaZeph". While this may not be as cool a name as Kumba, or Alpengeist, or even Ghost Rider; it is a very proud name for us New Orleanian coaster fans. Up until the late 70's, there was an amusement park in New Orleans called Pontchartrain Beach. This park had a fun wooden coaster called "The Zephyr." 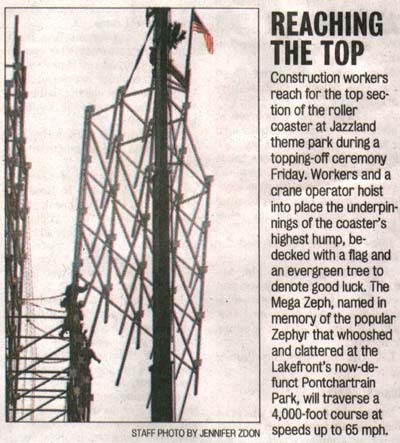 So, the Jazzland folks have seen fit to honor the Zephyr with this fitting tribute.